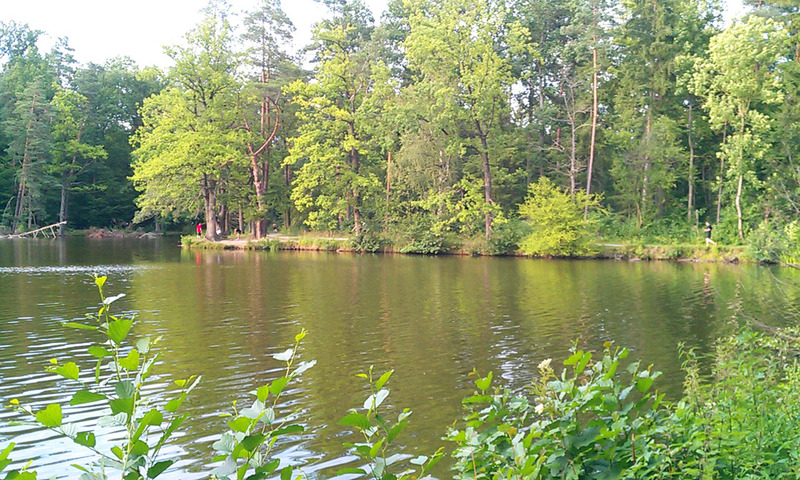 If the Schlossgarten is Stuttgart's most popular running track, Bärensee must be number two. The 2.5 km-long, curving lake set in the woods west of town provides a beautiful spot to run in nature, and attracts a lot of runners on summer evenings. Many runners drive there in a car because it's a bit difficult to get to. But if you are in Stuttgart without a car, then this route will do the trick. 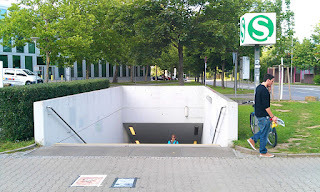 It starts at the university campus, at the Universität S-Bahn train station, then heads the 1.5 km to the lake from there. NOTE: If you have a car and want to drive to the lake, just take route 14 straight west from downtown. After you pass Wildparkstraße (L1187), keep going west on Magstadter Straße for a few hundred meters until you see the parking area on the right side. You'll save 3 km by not running from/to the university. 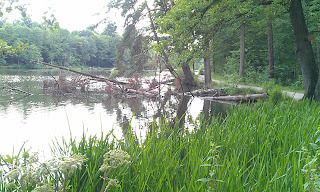 The university sits up on a ridge above the wooded lake valley. There's a 45 meter drop, which -- of course -- you have to run back up again at the end. When you arrive at the underground Universität S-Bahn station, get out at the south exit, on Universitätsstraße. 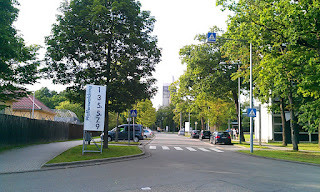 Turn left (east) and run past the south edge of campus until the street curves to the right. Turn left there on Pfaffenwaldring. The university is a technical college, with lots of interesting stuff scattered around: giant wind tunnels and gas tanks, a high-performance computing center. Looks like a fun place to study! 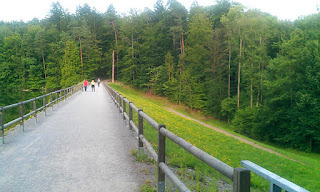 Just run straight down the Pfaffenwaldring, past the tall building at the end, and then straight into the woods on the trail called Kurze Allee, heading north. The trail crosses a bigger trail, but keep going straight. Then it heads steeply downhill. Sorry, but we'll have to run back up here later. Enjoy the downhill! Kurze Allee ends by running into another path, but just turn right and you'll see that Kurze Allee continues onward just 20 meters to the east. 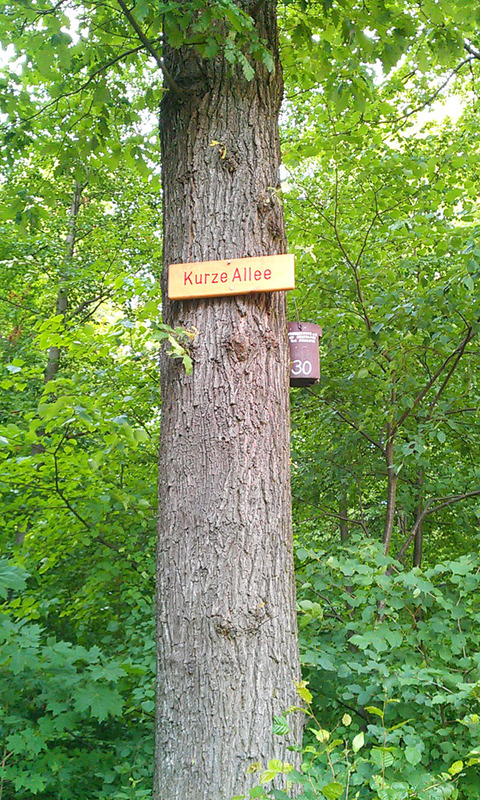 So turn left on the next stretch of Kurze Allee and keep heading north. 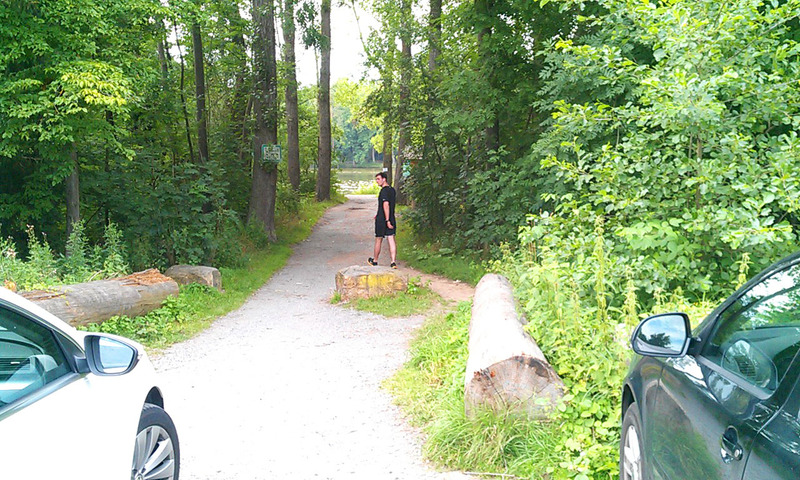 The trail comes out to a paved road, Magstadter Straße, where you'll see cars from other runners parked along the roadside. There is a path leading from the parking lot to the east end of the lake, just a few meters north of the road. When you come to the water, it doesn't really matter which way you head, but this description turns right to run counter-clockwise around the lake, taking 5 km in total. 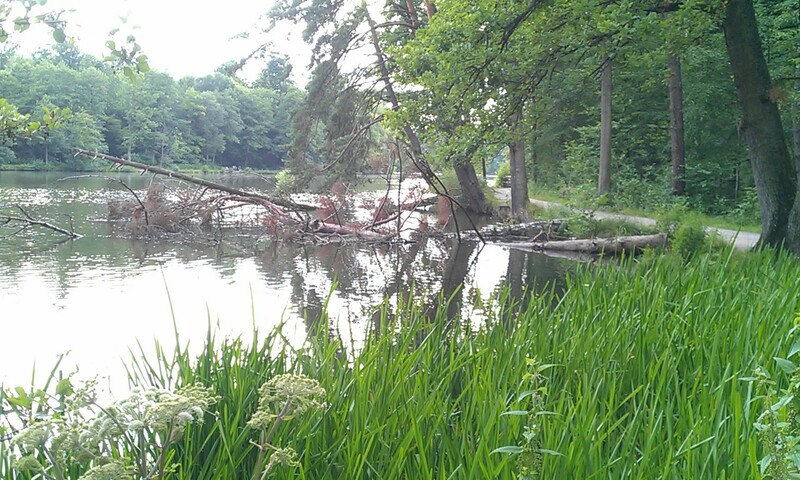 Just stay on the waterside trails and you can't go wrong. There are also dozens of other trails heading out in every direction: it's a great place to go exploring these beautiful wooded hills! The lake is actually three little lakes divided by earthen dikes. This eastern lake is the Pfaffensee, then comes the Neuer See, then finally you'll come to Bärensee. The whole area was once a royal hunting ground for the Würtemberger kings. While running along the north side of the lake and passing the second dike, you'll see a house crowning a bluff along the right side, surrounded by lawn. 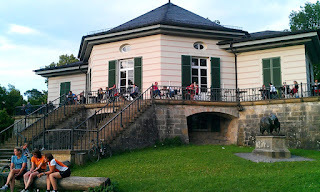 This is the Bärenschlössle, a restaurant and beer garden. 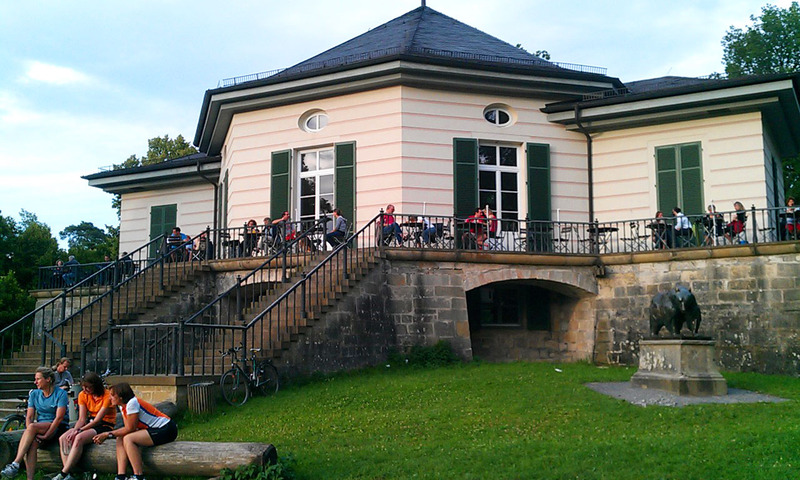 It was built by one of the kings as a hunting lodge, but now serves a thankful public as a great waterside hangout. About 400 meters past the Bärenschlössle, Bärensee ends and the path goes around a meadow before turning around to head back down the south shore of the lake. There are some huge oaks which have died along the south shore. I guess they were there before the valley was flooded for the hydroelectric power plants. Some of the ancient trees have been dead for a long time. When you round Neuer See, you'll run over the earthen dam that keeps the water in the lakes. When you reach the spot where you first came to the lakeside, turn south and head back uphill to the university.